29. Trump’s Classroom Cold Open (Dec. 3, 2016) Trump retweets ridiculous people, like a 16-year-old and a white supremacist. This one’s sadder than it is funny, though, because most of it doesn’t even require jokes. You can watch that sketch here. 28. Donald Trump Prepares Cold Open (Nov. 19, 2016) Fresh off winning the election, Trump’s completely unprepared. We already know that Mike Pence will do everything, but good effort, “SNL.” You can watch that sketch here. 27. Trump’s Christmas Cold Open (Dec. 17, 2016) Vladimir Putin and Rex Tillerson drop by Trump Tower for Christmas. This one definitely brings to mind the phrase, “No puppet, no puppet.” It's also, perhaps, the most outright terrifying of all of these. You can watch that sketch here. 26. The O'Reilly Factor with Donald Trump (April 8, 2017) Alec Baldwin played both a scandalized Bill O'Reilly and Trump, who appeared on O'Reilly's show to defend him. A clueless Trump is a nice addition to this one but he's ultimately just an addition to another gag. You can watch the sketch here. 25. Donald Trump vs. Hillary Clinton — Debate Three Cold Open (Oct. 22, 2016) Trump is winning “every single poll taken outside a Cracker Barrel,” but it’s Kate McKinnon as Hillary Clinton who steals this one — kind of like in real life. You can watch that sketch here. 24. Donald Trump vs. Hillary Clinton — Debate 1 Cold Open (Oct. 1, 2016) The first debate really found Baldwin hitting the Trump stride. It’s mostly just him shouting “Gina” in a very insistent tone (his weird pronunciation of "China"). “Yuge Gina” gets a lot of mileage though. You can watch that sketch here. 23. Trump Takes the Appeals Court to 'The People's Court' (Feb. 11, 2017) "SNL" made good on Trump's all-caps "SEE YOU IN COURT" tweet by taking the 9th Circuit Court of Appeals to "The People's Court." But Judge Milian hassling Trump about his travel ban was a bit too short to really take off. Watch the sketch here. 22. White House Christmas Cold Open (Dec. 2. 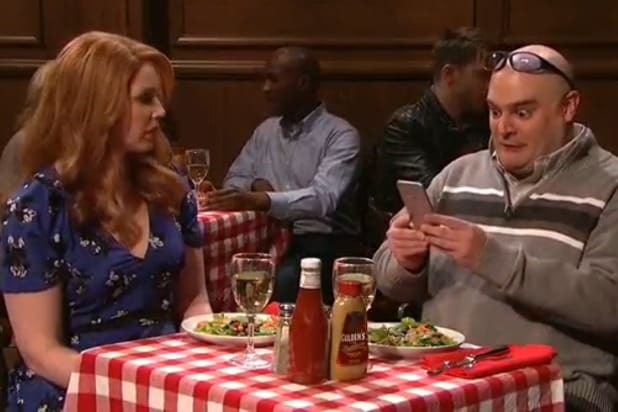 2017) Donald Trump is visited by "the ghost of witness flipped," Gen. Michael Flynn, but it's Kate McKinnon's Hillary Clinton who steals the sketch. Watch the video here. 21. Sean Spicer Confronts Trump (May 13, 2017) After a tough White House Press Briefing, Melissa McCarthy's Press Secretary Sean Spicer rode his motorized podium to New York to confront Trump on lies. The pair wound up making out. Watch the sketch here. 20. Donald Trump Phoenix Rally Cold Open (Aug. 24, 2016) Trump gives a goodbye to Steve Bannon and pledges to build the Wall on the U.S.-Mexico border and make the American tax payer pay for it. Watch the sketch here. 19. Trump's People (April 8, 2017) Trump checks in with rural white Americans after ordering an airstrike on Syria. Desperate to keep everyone happy, he promises everyone will have coal jobs for the rest of their lives and that he'll slash minimum wage. The final joke about "finger chili" is a standout moment. Watch the sketch right here. 18. Press Conference With Baltic Leaders (April 7, 2018) Trump meets with leaders from the Baltics and gets so bored that he finally tells America what he really thinks about the presidency. Watch the sketch here. 17. Fox & Friends Cold Open (Feb. 5) Trump called in to his favorite show, Fox News' "Fox & Friends," for a quick pick-me-up after his State of the Union address. Trump isn't the complete focus of this one, but when he shows up to tout the address, he gets in some good jokes -- like how "people" are saying the SOTU was better than Martin Luther King's "I Dream of Jeannie" speech. Watch the sketch here. 16. VP Debate Cold Open (Oct. 8, 2o16) Trump nabs the spotlight from the vice presidential debate and realizes he needs to be a lot more careful about talking about sexually assaulting people while wearing hot mics. Describing himself as a gross groping hurricane is hilariously cringe-worthy. You can watch that sketch here. 15. Trump might have ties to Zorblat-9 as aliens invade (March 11, 2017) Trump spoke to American troops to rally them in a battle against super-powerful space aliens. Unfortunately, Trump's old standbys like "we don't win anymore" and "we're going to bring coal back" were not all that helpful. Most of the rhetoric is stuff we've heard before, but Leslie Jones' and Sasheer Zamata's moments near the end elevate the sketch. Watch the sketch here. 14. White House Tree Trimming Cold Open (Dec. 16, 2017) Joined by his family, Mike Pence, Jeff Sessions, Sarah Huckabee Sanders and Kellyanne Conway, Trump decks his Christmas tree by remembering the losers in his first year as president. Watch the video here. 13. Trump call with Mayor Carmen Yulín Cruz (Sept. 30, 2016) Trump fields a call with Mayor Carmen Yulín Cruz of San Juan, Puerto Rico, and reminds her that if the U.S. territory should have invested in FEMA Prime if it wanted fast hurricane relief. Watch the sketch here. 12. Trump Administration sings "Hallelujah" (May 20, 2017) The final cold open of the season references Kate McKinnon's cold open as Hillary Clinton, making a perfect joke about Donald Trump's week of news scandals. Scarlett Johansson even returned for a quick guest appearance to reprise her role as Ivanka Trump. Watch it here. 11. Hillary Clinton/Donald Trump Cold Open (Nov. 5, 2016) CNN doesn’t care that Trump literally kisses the FBI, Putin and the KKK, instead pestering Hillary about emails. Alec and Kate heartwarming run through Times Square is the real sweet spot of the sketch. You can watch that sketch here. 10. 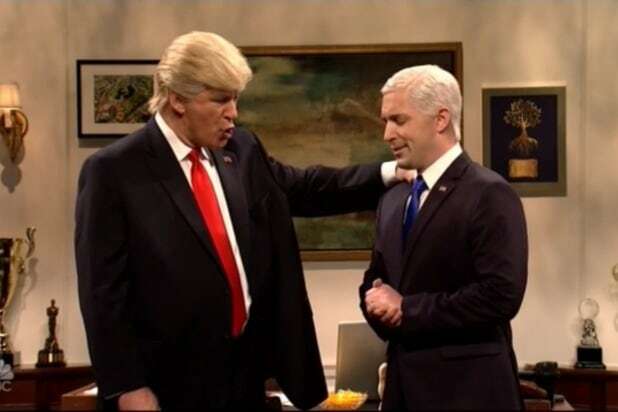 Donald Trump gives Bannon and Kushner the 'Apprentice' Treatment (April 15, 2017) After a week of reports about infighting between Steve Bannon and Jared Kushner, "SNL" pits the two advisers against each other in to see who will be eliminated. Spoiler alert: It's Bannon. Watch the sketch here. 9. Donald Trump Trucker Rally Did Cold Open (Oct. 14, 2017) Baldwin's Trump continues to make Vice President Mike Pence (Beck Bennett) walk out of things in protest, including a basketball game, a Starbucks and a gay wedding. Watch the sketch here. 8. Donald Trump vs. Hillary Clinton Town Hall Debate Cold Open (Oct. 15, 2016) Of all the debates, the second was the funniest. Trump lurking in the background and slipping past Hillary like he’s the shark in a “Jaws” movie completely captures the awkwardness of the real event. You can watch that sketch here. 7. Paul Manafort's House Cold Open (Nov. 4, 2017) After Robert Mueller indicts Paul Manafort, Trump offers a pardon plan: Pretend he's a Thanksgiving turkey. Watch the video here. 6. Donald Trump Robert Mueller Cold Open (May 19, 2018) Riffing on the finale of "The Sopranos," Trump meets with members of his inner circle at a restaurant, including Ben Stiller's Michael Cohen, only to find Robert De Niro's Robert Mueller watching him. Check out the sketch here. 5. Donald Trump Press Conference Cold Open (Jan. 14, 2017) It might be the lowest-brow of the sketches, but Trump accidentally talking about urine throughout his press conference is bested only by the line, “I’m not talking about the pee-pee, because it didn’t happen and it wasn’t as cool as it sounds.” You can watch that sketch here. 4. 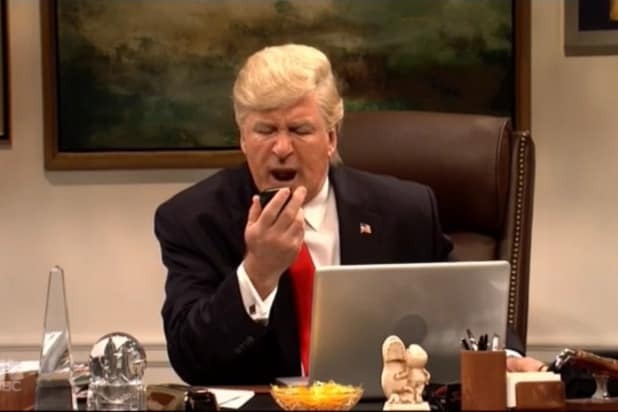 Donald Trump and Steve Bannon call world leaders (Feb. 4, 2017) "SNL" channels two weeks of executive actions and other Trump news items to turn out a ton of jokes that channel absurdity while still finding new ways to be funny. Watch the sketch here. 3. Donald Trump interview with Lester Holt (May 13, 2017) After firing former FBI Director James Comey, Trump realized he could say just about anything with no consequences. He tried it out in an interview with Lester Holt. Watch the sketch here. 2. Presidential Address (March 4, 2018) Trump addresses the gun control debate and talks about how America is in the top 5 countries in the world -- but lags behind Wakanda, the fictional African nation from the movie "Black Panther." Watch the sketch here. 1. Michael Cohen Wiretap Cold Open (May 5, 2018) Trump's wiretapped attorney, Michael Cohen, accidentally calls and incriminates Trump -- along with everybody else -- in a star-studded cold-open that ends with a surprise appearance by the real life Stormy Daniels. Watch it here.